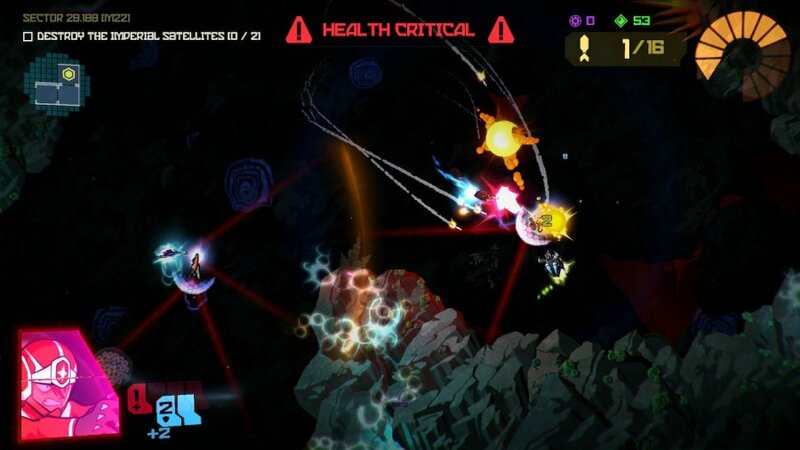 Last year, Seattle-based developer 17-Bit released GALAK-Z: Variant S, a free-to-play Switch sequel to its much-loved 2015 PS4 game GALAK-Z: The Dimensional. While Variant S was reasonably well-received, its freemium-style timers and more restrictive stages meant most fans of the original felt this Switch follow-up was a lesser successor; it has its place, but it didn't quite scratch the itch. 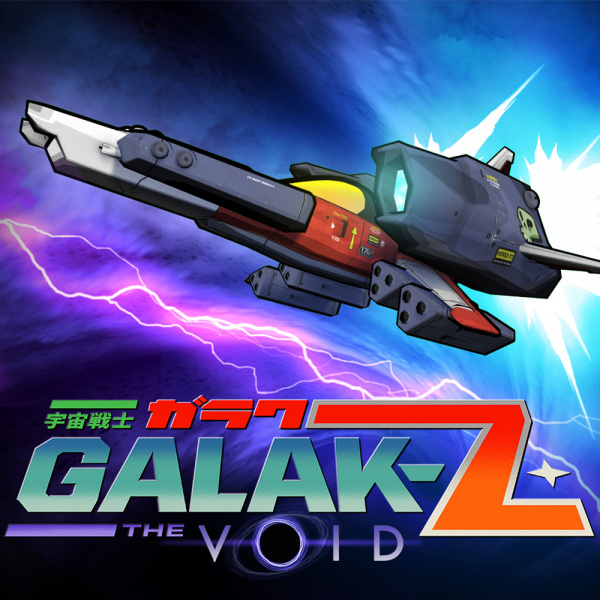 Seemingly realising it had nailed the formula more convincingly the first time around, 17-Bit has now ported the original GALAK-Z to Switch, albeit in a snazzy Deluxe Edition that contains both the base PS4 game and its DLC, The Void. For those unfamiliar with the concept, GALAK-Z is a rogue-lite shoot ‘em up in which you play as A-Tak, the last remaining survivor of his space squadron. After encountering the science ship USS Axelios and its commander Beam, A-Tak finds himself embroiled in an intergalactic war and is tasked with taking out the evil Imperials (and any other hostile sods who get in the way). The game plays out like an ‘80s sci-fi anime, and happily embraces this idea wherever possible. Stages aren’t split into worlds and levels: instead, there are four ‘seasons’, each with five ‘episodes’, and before you start each episode you’re given a fake title card, complete with fake writer’s name. Pause the game and you’ll be greeted with a brilliantly authentic VCR-style menu, while the in-game map has the sort of colour bleeding you’d expect from a VHS tape that’s been watched its fair share of times. It’s an exceptionally well-crafted aesthetic, and it helps keep your attention through the game’s first, trying hours. 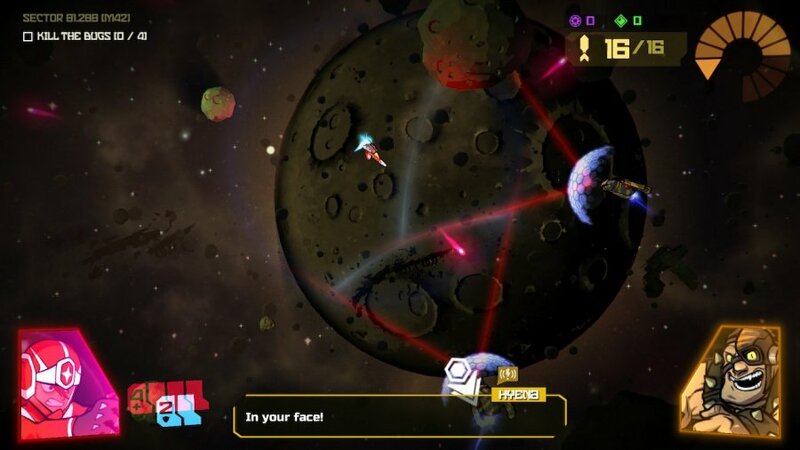 GALAK-Z is not an easy game: far from it. Given its rogue-lite nature, the general aim is to make your way through each episode, perform the task that’s required of you (usually collecting something or destroying something else) then head back to a warp point and activate it to zoom back to the safety of your hub. All the usual traits of the genre apply here. Stages are procedurally-generated, so each time you play it’ll be a completely different experience. Players start out criminally under-armed and can expand their arsenal with a whole host of upgrades, either between each episode or at any of the mid-stage shops they stumble upon. And, most notably of all, the game is ruddy hard. 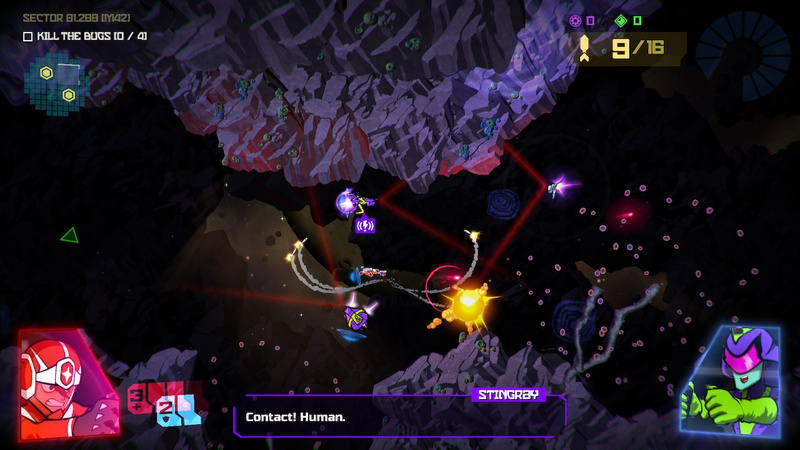 The fact it’s technically a twin-stick shooter will probably mean that your first few ventures in GALAK-Z will end with your teeth floating through space after one of the many ruthless enemies you encounter blows your face off with gusto. This is a game that’s unashamedly challenging, and simply ploughing into groups of enemies all guns blazing as if you were playing a typical twin-stick affair like Geometry Wars (or Robotron, for the grizzled veterans out there) will result in death quicker than you can figure out how to spell the game’s title. Instead, this is all about methodically making your way through each section, approaching enemies slowly, picking your battles carefully and trying to isolate them so you can take them out one at a time. Your health meter is deliberately pitiful and your rechargeable shield is initially only good enough to take a couple of hits before you’re exposed, so any attempts to go gung-ho and trade firepower with its relatively clever AI probably won’t end in your favour. This is even more important when you consider GALAK-Z’s ruthless attitude towards restarts. When played the way it was originally intended, any time you die you’re sent way back to the first episode of the season you’re on. You’ll find yourself spontaneously bellowing out swear words you didn’t even know existed if you spend ages carefully making your way to episode five, only to be picked off by an enemy and forced to start all over again. While there are sometimes ways around this – by picking up ‘Crash Coins’ you can restart an episode, albeit with all your power-ups lying in a recovery crate somewhere in the stage – for the most part, death means death. Thankfully, GALAK-Z contains the much-welcomed Arcade mode PS4 owners received in a post-launch update. Here, dying at the end of an episode simply brings you back to the start of that episode (minus the upgrades you purchased right before it started) rather than dumping you back at the beginning of the entire series. 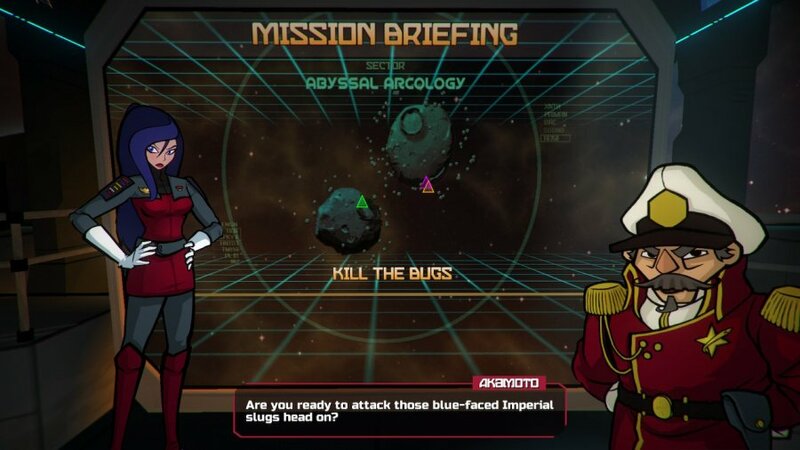 Although this may make purists baulk – the game menu insists that the standard Rogue mode is “the way GALAK-Z was meant to be played" – it also makes what would otherwise be an impenetrable game for some players far more accessible. Besides, it’s not like being shot to bits by an overpowered enemy right at the exit and having to start an episode all over again won’t still have you swearing blue murder at the screen. Meanwhile, any masochists who fall on the opposite side of the spectrum and require even more punishment have The Void, a special endless mode that does away with that pesky story and just has you blasting away at increasingly difficult waves of enemies until you die. It's immensely hard, but that just makes high scores all the sweeter. Part of GALAK-Z’s initial challenge also lies with its controls. With forward and rear thrusters, a strafe move, a sort of mid-air dodge and the ability to transform into a mech later on (with its own set of gadgetry, like a sword and shield), it’s going to take you a while to adapt to your ship’s inertia-based movement. Quite often, your early deaths will be as a result of you not being able to navigate your way out of a dangerous situation quickly enough, which can initially be quite frustrating. Indeed, ‘frustrating’ is probably the underlying word that covers most of GALAK-Z’s initial playtime. If you think it’s the sort of game you might fancy playing, you have to bear in mind that you’re going to die a lot early on, and this might result in you not making a lot of progress until you slowly learn to master both your own ship’s controls and the game’s slower, more methodical pace. As long as you have the patience to get through that early three-or-four hours without exploding into a ball of rage, the upgrade-heavy joys that await you make it all worthwhile. 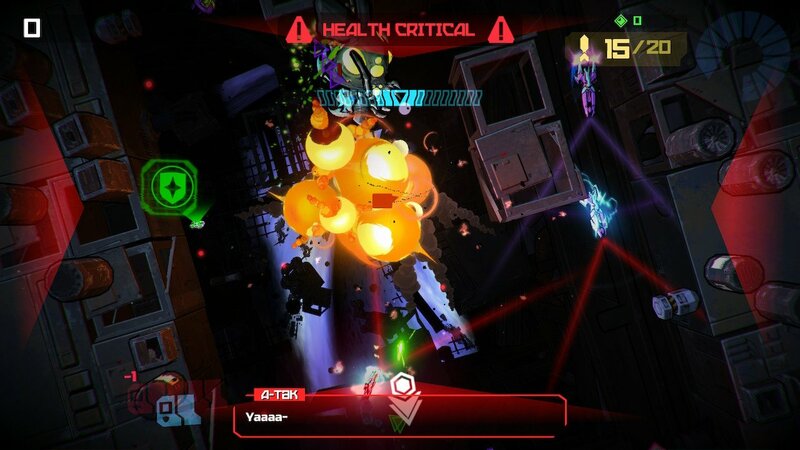 GALAK-Z isn’t a game for everyone: its rogue-lite nature, its high difficulty level and its punishing policy on death (even in its easier Arcade mode) will infuriate some players who are just expecting a quick blast of non-stop action. Treat it like the slower-paced exploration and survival game it’s supposed to be, and your patience will be rewarded with some genuinely satisfying space combat and a wide variety of customisable parts (not to mention its brilliant mech upgrade), all wrapped up in a fantastic ‘80s style aesthetic. Hmm... I think it looks quite poor. It reminds me of a Windows game from the mid 90's. I wonder, does it run at a locked 60fps? I think I've played it on PS4 before, but can't remember how it ran on that system. @60frames-please Nope. It was stuttery at times on PS4 and it's the same on Switch when there's a lot of action. Not enough to detract from the game though. Most seemingly mediocre games get an 8. @YANDMAN With the sheer volume of games hitting Switch at the moment, we're focusing on the ones that might actually be worth playing, hence there being a lot of high scores. If we reviewed everything, then you'd see the average plummet quite massively - but we simply don't have the capacity to review everything, so here we are. This game was also on PlayStation Vita. It's been portable for awhile. I’m loving the game but I found it rather buggy and prone to crashing. Anyone else experiencing similar? @NotSoCryptic What timeline are you in? @scully1888 Got it. Thanks for the info. NL: "focusing on the ones that might actually be worth playing"
Everyone: "clearly your definition ... differs from ours"
@Damo You guys should start using tenths... an 8.9 is "Great." An 8.0 could be "Good despite faults." As a new reviewer you kindof hit the nail on the head NL...there's just SO MANY GAMES out there right now. Part of why I want to review games is...dude Switch games aint cheap and time is at a premium. The Switch is an awesome system but damn man, two years on the lineup is crammed with actually playable content. @Cipher1332 The game has crashed on me twice, each time in the middle of Season 2. I’ve been playing Rogue mode, but considering switching to Arcade just to minimize my loss of progress! Hope they patch and make the game more stable.